Podcast Awards – We Need Your Nomination(s)! 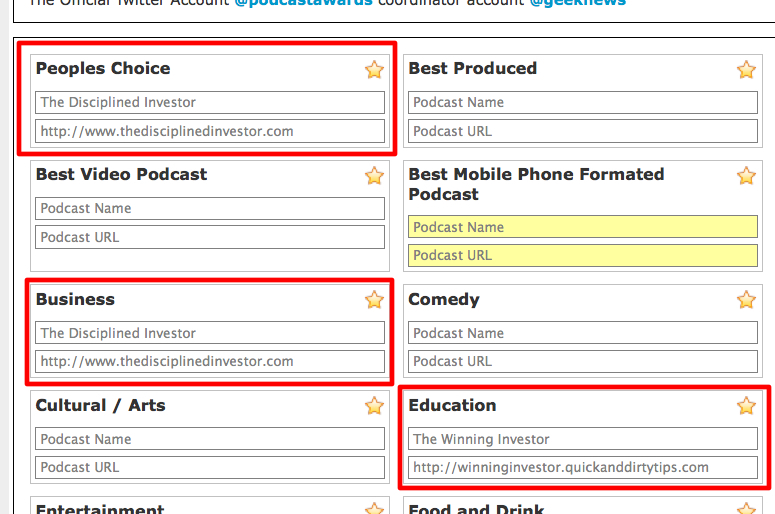 If you have enjoyed our podcasts, why not nominated them for the 7th Annual Podcast Awards? It is easy and it will mean a whole heck of a lot to us…Thanks! Important: You only get to submit the nomination form “1” time. Please fill it out completely! Once you hit Submit you are done for 2011! Please do not submit the same show in multiple categories. Important: Do not nominate the same show for People’s Choice and Best Produced, nominate 2 different shows in the top two categories. You can nominate your favorite show in one of the top two categories and one additional category. Nominating one show in multiple sub-categories will get your nomination thrown out.